RAIR (Recycled Artist in Residency) is a young yet accomplished project located within a construction waste recycling center in Philadelphia. They have twelve hours left in a fundraising campaign to open the trash-stream residency program to applications from artists in the Spring of 2013. They hope to hire staff with the money and become a viable arts-trash organization. Artists have long sourced art supplies from the waste stream, for economic reasons, to leverage the history and patina of used and discarded items, and to specifically comment on waste and discard practices. However, curb-side picking is not nearly as efficient or rewarding as wading through a compiled collection of waste at recycling centers, transfer stations and dumps, most of which are inaccessible to artists and members of the public, particularly in urban areas. RAIR is giving artists access to the waste stream and to space to make their art. For those of you new to crowd sourcing funds, third party systems like Kickstarter and Indiegogo usually ask fund raisers to provide thank you “perks” to donors. 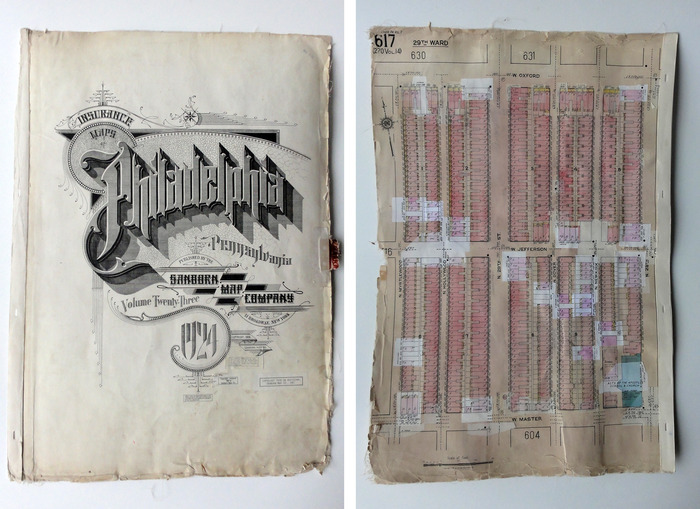 The perks for the RAIR project fundraiser are artistic Discard Studies in and of themselves, including a stash of Sanborn Maps they found in the trash heap, and a Taxonomy of Trash poster by Tim Eads. Sanborn Maps are insurance maps that show a very detailed and layered history of cities. The pastings represent periodic updates of the maps. Each 18″x26″ page is of a different section of the city and tells a story of how the neighborhood changed over time. 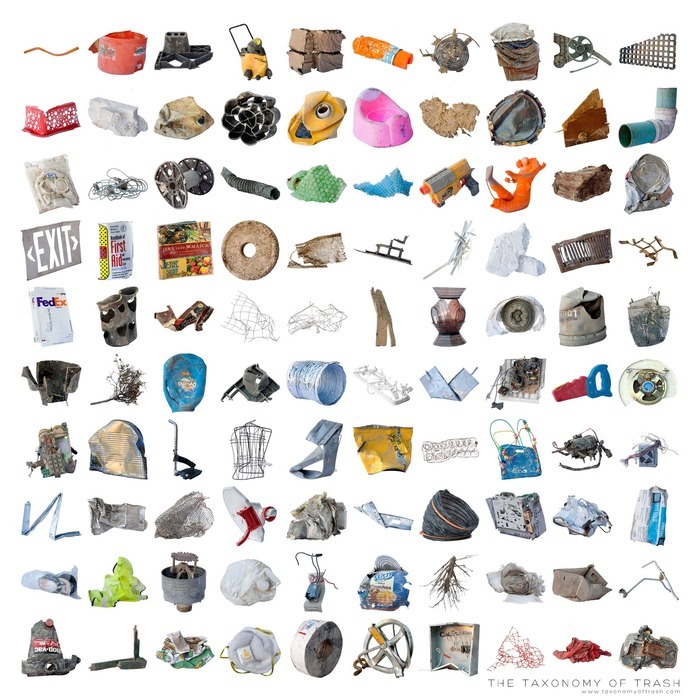 The Taxonomy of Trash was a collaborative effort led by artist Tim Eads where the team sourced, analyzed and categorized objects from RAIR’s waste stream. “RAIR (Recycled Artist-In-Residency) is a group of dedicated individuals working to connect art and sustainability. We provide artists with salvaged materials and comfortable workspace while increasing awareness about the waste stream. A piece made at RAIR: Abigail DeVille has just completed a short residency at RAIR. 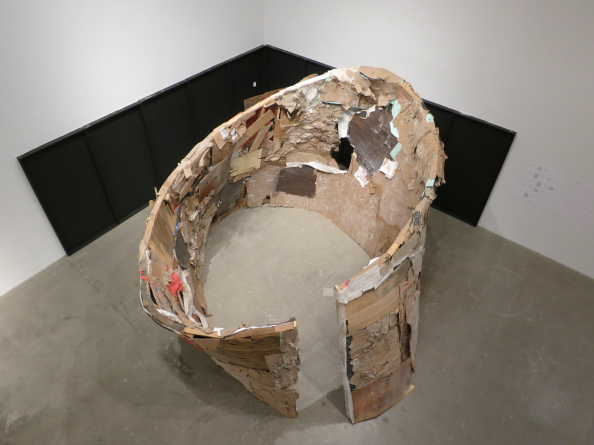 The Hooverville Torqued Ellipse is meticulously crafted from recycled materials and was built in RAIR’s studio space. The piece is on display at the Marginal Utility Gallery at the Institute for Contemporary Art in Philadelphia from July 18 – August 12, 2012. After the exhibit closes, the project will be put back in the waste stream and recycled at Revolution Recovery. This entry was posted in Art, Recycling, Reuse and tagged art, artist residency, DIY, RAIR, rash, se, te stream, Trash, waste stream. Bookmark the permalink.